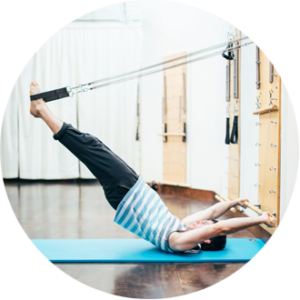 Have you always wondered how Pilates works on the springboard or other equipment? The springboard is similar to the reformer, with two important differences. First, springboard has 2 different levels of resistance, one set of springs for arms (yellow), and another for legs (purple). In addition, springboards are more unstable than the smooth pulley system on the reformer. That means your body needs to work to stabilize yourself during your springboard workout. In the beginner level class you’ll learn some basic roll-down bar exercises such as rollups, swan, lat and tricep presses and squats with bicep curls. With the handles on, you’ll try the hundred and arm circles. And with leg springs, single leg pulls and circles, running, frog, bicycle and side kicks. And because your own body is providing stability, you’ll feel it in all your smaller intrinsic muscles. It’s a great complement to your mat workout! If you’re looking for more challenge and to add on to your springboard practice, you’ll love this intermediate level class that incorporates cardio, heavier resistance, and more advanced springboard exercises. You may be doing hip ups with the stability bar, or or use the roll down bar for arch back roll downs, side roll ups, jackknife, arabesque, or teaser. With handles, you can do punching, hug a tree, or back rowing. Some of the more advanced leg spring exercises incorporate levitation with leg pulls, running or bicycle. You’ll definitely work up a sweat and get those muscles shaking!